Nuts are an ancient, natural and nutritious food which have been grown in Britain since time immemorial. During the Tudor period their cultivation on a properly managed basis was evident and formed the foundation upon which the Victorians planted a large number of cob nut orchards, called plats, resulting in some 7000 acres being grown by the turn of the century. The predominant nut grown was the Kentish cobnut, a type of cultivated hazelnut, bred in 1830 by a Mr Lambert of Goudhurst in Kent. The Kentish cobnut is a larger nut than a hazelnut and has a different and distinctive flavour of its own. The Victorians considered the Kentish cobnuts a form of delicacy and would eat them as an accompaniment to after dinner port. Regrettably the Kentish cobnut had been in decline for some decades and only about 250 acres are still grown today. Most of the remaining productive plats are seventy five to a hundred years old and are managed in a similar way to other fruit orchards in the county. Potash Farm Plantation is just this. 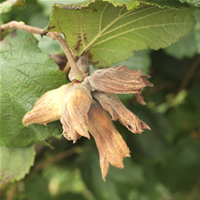 A Kentish cobnut is a type of hazelnut, just as a Bramley is a type of apple. Unlike most other nuts, cobnuts are sold fresh, not partially dried. 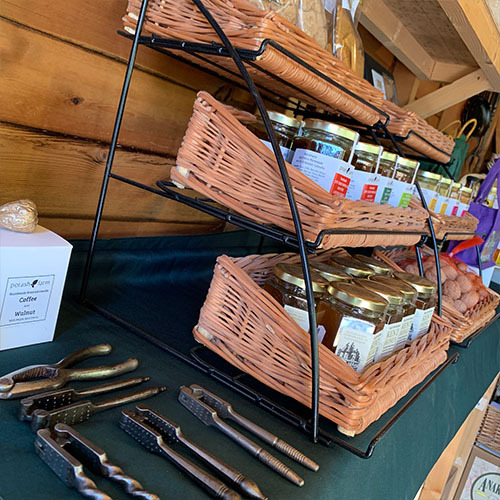 They are usually in season from the end of August through to October, but stored nuts may be available from selected outlets through to Christmas. At the beginning of the season the husks are green and the kernels particularly juicy. Nuts harvested later on are ripe, have brown shells and husks, and the full flavour has developed. Cobnuts are sold fresh, and like many other fresh foods they keep well in the fridge, for example in the salad drawer. They should not be allowed to sweat. Husks should be removed if loose but it is not necessary to take off every one. The addition of a little salt helps preserve the nuts. Stored correctly, ripe nuts will keep until Christmas and beyond. Unshelled cobnuts may also be frozen, although they may lose their crispness. Cobnuts are delicious fresh, for example on their own or in salads. Some people like to eat them with a little salt. They are also excellent roasted, which brings out their flavour. Roasted nuts can be eaten on their own, or used whole, chopped or ground to flavour pasta, meringues, crumbles and cakes etc. To roast cobnuts, crack and shell them, then cook them on tinfoil or a baking tray in an oven heated to about 150C, 300F, Gas Mark 2, for an hour or so the cooking time depends on how ripe and how dry they are. First they become soft, but do not remove them until they have hardened. Be careful not to let them burn. They can also be cooked in a microwave oven. Cobnut kernels typically contain 12% - 17% protein by dry weight, and about 10%-15% fibre. Cobnuts are very rich in vitamin E and in calcium, typically containing about 21mg and 141mg per 100g kernel (dry weight) respectively. They provided about 0.4mg and 0.55mg of vitamins B1 and B6 respectively per 100g dry weight. Most cobnuts are grown in Kent, but there are commercial orchards throughout the country. 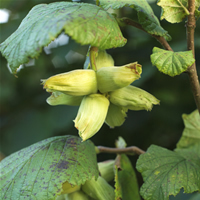 Cobnuts can be purchased through Farmers' Markets, pick-your-own, mail order, or some supermarkets and greengrocers. You can grow cobnuts in your garden, but the grey squirrels may eat them before they are ripe.